Together Cohen and Howard both had big days. They combined for 24 carries, 169 yards, and 2 touchdowns. Add in Trubisky rushes and the Bears picked up over 200 yards on the ground, with a stellar average of 7 yards per carry. There are no excuses for a team to lose when they run the ball like that. We saw a mixture of different formations as it seems the Bears finally opened up the playbook. While that helped keep the defense off balance, it also created a few issues for Chicago’s offense. On one play, they had to call an early time out after Kendall Wright and Josh Bellamy couldn’t figure out where to line up, and on another Mitchell Trubisky went to his left to hand off to Benny Cunningham, who had run to Trubisky’s right. There was a lot of consternation at the start of training camp last July when Trubisky had trouble receiving snaps under center. For the first time this season, we saw that issue rear it’s ugly head, as Trubisky dropped a good snap from Cody Whitehair and was unable to recover it. Detroit defender DJ Hayden picked up the ball and waltzed into the end zone. While we’re on Trubisky, accuracy was an issue again today. On one particularly egregious series at the start of the 2nd half, he missed two throws in a row that both would have led to a first down nearly in scoring range. 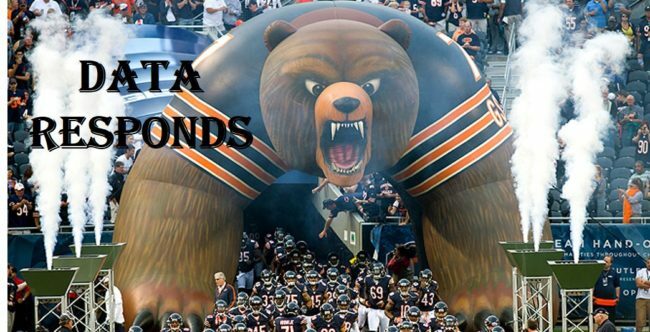 Instead the Bears went three and out and punted. He’s been running into trouble when he doesn’t set his feet. Overall it was a day of progress for Trubisky though. The coaches trusted him more and opened up the offense, and he mostly responded. He continues to make good decisions, and used his legs as a weapon more today, now he needs to get more consistent in his footwork and accuracy. Another rookie who had himself a solid day was tight end Adam Shaheen, who caught his 2nd career touchdown and had 4 receptions (on 4 targets) for 41 yards while also providing solid blocking in the run game. His progress is something to watch down the stretch of the season. Kyle Long was back from a hand injury that kept him out last week, and he picked up two big penalties. In the first half, he had a dumb late hit that set Chicago back 15 yards, and in the 2nd half he got downfield too early on a screen pass in the 3rd quarter. The offensive line overall had a good day though. They gave up 0 sacks (and not a ton of pressure) of Trubisky and opened up plenty of running lanes. When Chicago needed to run a 2-minute drill late in the game, they didn’t have Tarik Cohen or Adam Shaheen on the field, and Dontrelle Inman only played some of the snaps. Those are probably Chicago’s 3 best pass targets, and the Bears took them off the field in must-pass situations. Why? Despite the odd personnel decisions, Trubisky successfully operated a 2-minute drill for the first time in his career. He marched the Bears down inside the 30 in under 90 seconds for what should have been the game-tying field goal. That’s a nice sign of growth from the rookie (though he missed several throws on the drive). Of course the defense starts to make baffling personnel decisions as soon as the offense finally gets their act together. For some reason, they decided to rotate cornerback Marcus Cooper in the game, replacing Prince Amukamara, who has been playing well. Cooper promptly gave up a 17 yard completion on 3rd and 15 when he wasn’t even within 5 yards of his man, followed by a deep touchdown where his man again appeared to be uncovered. Linebacker Christian Jones called plays for the 2nd week in a row, and unsurprisingly he had a rough day for the 2nd week in a row. There were also several miscommunications and missed calls defense-wide, indicating confusion about the play call Jones relayed to them. It’s obvious that Jones isn’t capable of this responsibility, yet coaches continue giving it to him instead of the more capable Nick Kwiatkoski or John Timu. Official snap counts aren’t out yet, but I saw a lot of Pernell McPhee on the field today, and he did absolutely nothing. He just looks shot. He’s slow and gets pushed around. I don’t think rookie Isaiah Irving has gotten more than a spot snap or two on defense this year, but they might need to try him there more, or get another guy in who they trust to play. The lack of competent OLB play opposite Leonard Floyd (who has been solid but nothing special) is killing Chicago’s pass rush. One adjustment defensive coordinator Vic Fangio made in the 2nd half was going to more 3-man rushes while dropping 8 into coverage. I don’t like doing that, but it worked quite well for the defense, so I can’t really complain. Detroit wide receiver Golden Tate had a quiet day, which is a credit to nickel CB Cre’von LeBlanc. He has played well filling in for Bryce Callahan the last two weeks. It was a brutal injury day for the defense, as Leonard Floyd (knee), Eddie Goldman (wrist), and Kyle Fuller (hand) all suffered injuries. Fuller and Goldman were both able to return to the game, but Floyd’s knee injury looked gruesome and he’s probably out for the year. For the 2nd week in a row, Chicago’s defense gave the game away in the 4th quarter after the offense put them in position to have a chance. This unit dominated for a month before the bye, but has lacked the edge since. You can make the argument that the offense has outplayed the defense over the last 2 weeks. One of the biggest differences has been turnovers. After forcing a ton of them in the 3 weeks prior to the bye, they’ve forced one over the last two games. They did get a fumble recovery today, but dropped three interceptions (two by Fuller and one by LeBlanc). Remind me why kicker Connor Barth is still a Bear. He shanked another kick today, this one a 46 yarder that would have sent the game to overtime. He continues to be bad at his job, yet somehow continues to keep his job. Maybe this will finally cost him the spot that he should have lost over a year ago. It was good to see special teams ace Sherrick McManis back today, and he had a nice tackle on a kickoff return (though he did pick up a penalty later too). Isaiah Irving had a good game on special teams too. He picked up a few tackles, including one big hit to drop Detroit’s return man behind the 20 yard line. Tarik Cohen needs to learn to kneel the ball on kickoff returns. He brought it out five times today, and I don’t think he got past the 25 yard line once.